This paper is only intended to provide a brief overview of the potential of public banking in a Welsh context: an issue which has become particularly relevant in the wake of the report of the Silk Commission in November 2012, the findings of which have given added impetus to cross-party calls for borrowing powers for the Welsh Assembly Government. This piece is only intended to provide a stimulus for further investigation and, as such, and in the interests of readability, there are complex concepts which do not receive here the extensive discussion they require and I am aware that much is kept general which deserves the most specific of analysis; wherever necessary references to further reading, in which these concepts can be further explored, have been provided. However, I hope that this paper leaves the reader with a reasonable outline of the possibilities which public banking possesses in the Welsh context and with their interest sufficiently engaged to go on and look into the topic in more detail. The economic history of the past 30 years has been, by and large, that of an uncontrolled expansion of the financial sector at the direct expense of the so called ‘real’ economy’ of manufacturing and production, brought about by the hegemony free-market doctrines, based principally on fundamentally ideological beliefs in deregulation and privatisation, which have become known as neo-Liberal or neo-Classical economics. The truth is that ‘intermediation’ should be the absolute mot juste to describe the financial system: banks should be middlemen between investment capital, often in the form of deposits, and the productive economy. As former US bank regulator William K. Black put it ‘Middlemen serve a very useful purpose, but should not be very big and should not make a lot of money’, going on to point out that, ‘In the world we live in, finance has become the dog instead of the tail […] They have become a parasite’. The private banks have established themselves in this position through the control of the primary mechanism by which money is created within our system: the issuing of credit. In this paper I will aim to briefly outline how this credit function could be redirected from the speculation and bubble creation, which constitute the dominant directions of credit issuance under private banking, towards more stable and sustainable areas which serve the public interest instead of those of shareholders and bank CEOs. This is not a theoretical method, but rather one which throughout the post-WW II period saw the German Landesbanken facilitate the growth of the mittelstand sector of Small and Medium Sized Enterprises (SMEs), as well as in the present day constituting the means by which the state-owned Bank of North Dakota (BND) contributes significantly to North Dakota being the only US State to run a budget surplus throughout the post-2008 crisis. Wales need a dedicated arms-length business-friendly agency working to attract export-oriented investment and support and encourage indigenous based exporters. This would doubtless be a very useful resource, but it would be no substitute for affordable and available credit. The paper also correctly focuses on the need for infrastructural investment, particularly in transport, in securing a successful economy, but fails to sufficiently criticise the role of privatisation in creating the current systemic problems of underinvestment caused by excessive profit-seeking on the part of rentier investors. The analysis in Offa’s Gap seems to base itself entirely on the attracting of exogenous investment, as did the WDA, and consequently ignores the real basic need of indigenous business, particularly SMEs, for affordable credit in order to develop and expand. In order for a productive economy to exist there must be adequate streams of affordable credit and it is the absence of such constructive investment which, I would submit, has been a vital contributing factor to the decline of the Welsh economy, and indeed that of the UK, in the past 30 years. Before continuing with this analysis it is worth briefly examining the current banking system and the effect of its operations on the real economy, in Wales as elsewhere. ‘What is money and where does it come from?’ are, remarkably, questions rarely asked in mainstream economics and even less so by members of the public; yet the answers to these two questions hold one of the keys to understanding the (mal)functioning of our economic system and for devising a new, more democratic direction. As the great American economist G.K. Galbraith observed in his fascinating study of the history of banking Money: Whence It Came, Where It Went, ‘The study of money, above all other fields in economics, is the one in which complexity is used to disguise truth or to evade truth, not to reveal it’ (Galbraith: 1975, p.1), stating later in the same text that, ‘The process by which banks create money is so simple that the mind is repelled’ (Galbraith: 1975, p.18). So what is money? The instinctive answer to this question for most people is that money is the physical notes and coins produced by the government; they may even go on to say that this money is produced at the Royal Mint at Llantrisant, ironically making this physical money one of an increasingly diminishing range of Welsh exports. Yet physical money of this sort, in the form of notes and coins, only accounts for approximately 3% of money in circulation. This version of money is indeed the product of government, as under the Bank Charter Act 1844 (7 & 8 Vict. c. 32) the power to create banknotes (and coins) became the exclusive preserve of the Bank of England, a power exercised in agreement with Westminster. Since the so-called ‘Nixon shock’ of 1971 ended the existing Bretton Woods system of international financial exchange by unilaterally cancelling the direct convertibility of the United States dollar to gold the banknotes of the Bank of England/UK government have been essentially what is known as a ‘fiat’ or ‘soft’ currency; that is, a monetary unit which is not backed by any ‘hard’ commodity such as gold and, consequently, is limited in quantity only by the inflationary consequences of overproduction. By far the largest role in creating broad money is played by the banking sector […] When banks make loans they create additional deposits for those that have borrowed the money. Subject only but crucially to confidence in their soundness, banks extend credit by simply increasing the borrowing customer’s current account […] That is, banks extend credit by creating money. The current system is a product of the fact that the Bank Charter Act 1844 prohibited banks from printing banknotes, but did not prohibit the issuing of money by ledger entry through the making of loans: with the advent of electronic systems in the past thirty years this facility to ‘print money’ by making entries into borrowers accounts with the stroke of a keypad has expanded significantly. Currently, then, there is a system in place whereby the power of money creation is largely in the hands of private corporations who are able to make sizeable profits through the levying of interest for their performance of this function. This system also leaves the private banks with the decision as to which sectors of the economy should be afforded lines of credit, and in the past thirty years this has moved increasingly away from the productive ‘real economy’ and towards speculation and bubble creation: with the results we now experience. 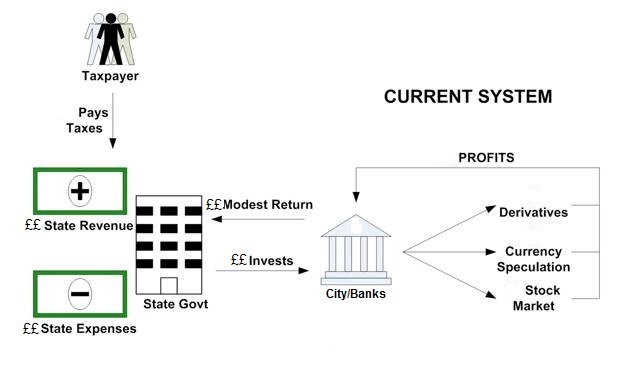 Part of the deposit base of private banks is the income of local and national government and this leads to a situation wherein private corporations use public money as a deposit base for speculation and lending for speculation (See Fig.1). The deposit base of BND is unique. Its primary deposit base is the State of North Dakota. All state funds and funds of state institutions are deposited with Bank of North Dakota, as required by law. Other deposits are accepted from any source, private citizens to the U.S. government. This framework provides the state of North Dakota with what is most needed for a local economy to thrive: affordable (and available) credit for SMEs and resources for the improvement of infrastructure. 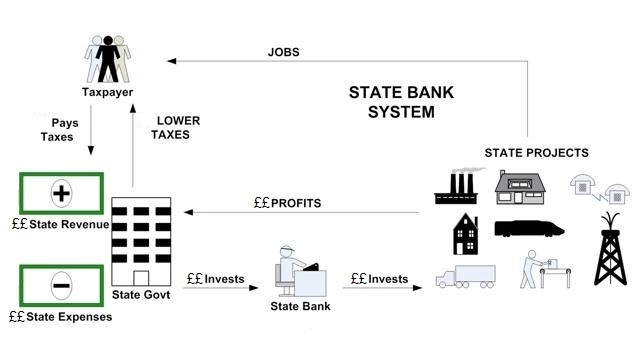 Under the state banking model the benefit derived from the interest accrued in the credit-issuing process is returned to the state and can be re-invested or spent in accordance with the public interest, instead of being paid to shareholders in dividends or in absurd bonuses to bankers who a merely carrying out a mechanical function, incompetently in many cases in the last thirty years (See Fig.2). In the case of North Dakota this has resulted in the state being the only US state to run a budget surplus throughout the financial crisis post-2007 and this must make their model at least worth considering. In Part 1 of its remit The Silk Commission was asked to consider the National Assembly for Wales’s current financial powers in relation to taxation and borrowing and its report was produced in November 2012. The commission concluded that the Welsh Assembly government should be granted borrowing powers, basing this conclusion partly on ‘international evidence’ drawn from a single World Bank publication from 1999: making this ‘evidence’ neither ideologically neutral, being the product of an organisation which is the éminence grise of global neo-liberalism, nor current, with many of its conclusions being weighed and found wanting by the latest financial crisis. The findings of the commission contains no consideration whatsoever of the role of banks in money creation through credit issuance, and the attendant problems of misallocation of investment, and no investigation of the success of public banking in the international context, for instance in the BRIC economies, or of the potential role of public banking in Wales. For this reason I feel that it is important that these issues be brought into the debate on the Welsh economy, as to ignore it would be to exclude a potentially democratising and sustainable banking system from the national conversation and would merely make any granting of borrowing powers to the Welsh Assembly Government nothing more than a new stream of income for the private banking system. 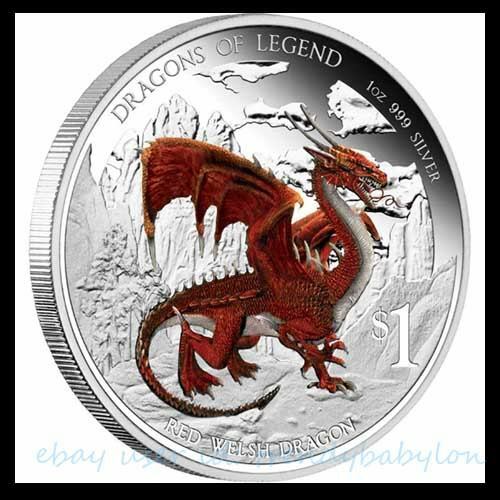 If all that ‘responsibility’ means in the fiscal context is for Wales as a political unit to submit itself to the ‘discipline’ of the bond markets, then this is indeed a very sorry direction in which the politicians of the Welsh Assembly are taking both their current constituents, and those yet to be born. There is a widely perceived need for change to the economic system today and especially for reform of the way in which banking operates, with the majority of the population feeling, rightly, that there is ‘something wrong’ with the way in which the economy, and particularly banking, currently functions. I believe that public banking can provide one of the possible directions of change which we so need in Wales and beyond and for this reason I would urge interested persons across all parties to look further into this topic.